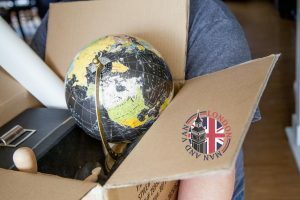 Do not panic – these are indeed difficult packing tasks but if you arm yourself with some outside-of-the-box thinking, you will be able to prep your items for the road not just in a short amount of time but also with flying colours. Can you think of anything sharper in your home other than your kitchen knives (no, a sharp wit does not count)? One poor packing decision and they may easily pierce a hole in the cardboard box set next to them and to cause some considerable damage to the items you have put in it. An even worse case-scenario would be for some of your knives to somehow end up injuring you, a member of your household or say the friendly man with a van in South Norwood SE25 which you hired to help you out with the move. To avoid this, you will probably try to pack your kitchen knives in countless layers of packing paper, bubble wrap and old towels. However, if you do that, you will end up with numerous big bundles and that won’t be very practical, will it? So, to avoid that you can simply wrap all of your sharp possessions with one layer of packing paper and to put them in your toolbox (considering you have one). Just don’t forget to wash them after that. You can hire the best and most trustworthy man and van in Old Oak Common NW10 or in any other part of London but your food still won’t be allowed in the moving vehicle. It is against the law for professional moving companies to deal with the transportation of food. So, if you don’t want to handle the moving of your fridge’s contents, it is best if you don’t take them with you. A few weeks prior the relocation, stop buying groceries so that you can gradually consume all or at least most of the food you have in your home. No food, no problems. It is great if you manage to find a reliable home removal company in London that is very honest with its clients and goes the extra mile in order to safely handle and transport even the tiniest moving box. But when it comes to jewellery, you are always advised to pack and move such valuable and delicate possessions on your own. Most people prefer to put their necklaces, bracelets and etc. in a jewellery box but sometimes that is not enough to prevent them from getting entangled. A more effective packing solution here is to use egg cartons. Put every jewellery piece you own in a separate dimple on the carton and then secure the carton with some tape or plastic wrap. Pack electronics and appliances in their original packaging and put soft, non-breakable items such as pillows, towels and blankets in large bin bags. To prevent your stemware from breaking, thoroughly wrap the stems of each of the glasses with bubble wrap. As you can see, every packing challenge has a solution.